KIA has just released a number of images that demonstrate their pride first performance SUV, the Kia Sportage in 2016, before it was officially released Sept. 15 at the Frankfurt International Motor Show 2015. The design of the model is demonstrated by a brand-new fourth generation Sportage carrying the theme of "Progressive Design 'which shows the dynamics of a slick design with the contours of the body firmly. Although part of the side still wearing the old design, but the new arrangement in the area fascia and stern aura of a fresh design. The most obvious spin in the typographical arrangement, headlights with new design is placed slightly higher than the previous model, accompanied by tiger-nose grille is greater. Complete with LED DRL increasingly used as a standard. While upgrading cool in the aft stern presented by new LED taillights. Shark fin belonging to older models Sportage will be retained, while the turn signal lights and reversing lights are now placed in the lower area of the bumper. 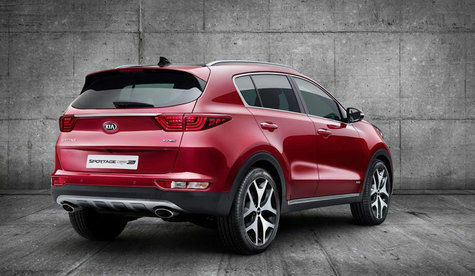 Unfortunately detail technical specifications 2016 Kia Sportage is still not available.